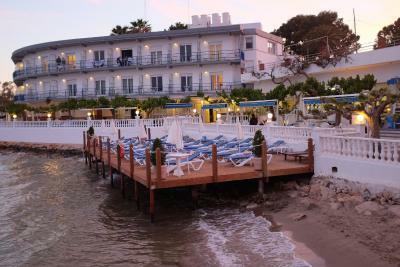 Lock in a great price for Hotel Restaurant Juanito Platja – rated 8.9 by recent guests! Very tranquil decked area over the sea. Lovely area and fantastic food particularly the seafood. Staff very friendly and professional. Would definitely return. Beach under your balcony. Great restaurant and impeccable service. The location was perfect for folks who want to vacation on the Mediterranean in a smaller out of the way town. Nice clean and quiet family hotel in a spectacular location directly on the beach. Excellent food in the restaurant. The view from our room—right over the water and out into the bay. Very friendly staff who are happy to assist with any requests. The hotel is right on the sea front and we had a lovely sea view from our room with a nice small balcony we could sit out on. The hotel has a decking area with sunbeds and there is easy access to the beach. We found the bed and pillows to be very comfortable. The shower had good pressure and you could adjust the height. Breakfast was nice and simple - croissants, bread, ham and cheese with a small cereal selection, fresh fruit and yoghurt. Room lovely, bed comfortable, balcony and view lovely, breakfast and terraces very nice. Staff very friendly. Location, excellent. Nice family run hotel, with simpel but very neat facilities. Great location by the sea. Friendly staff. Hotel Restaurant Juanito Platja This rating is a reflection of how the property compares to the industry standard when it comes to price, facilities and services available. It's based on a self-evaluation by the property. Use this rating to help choose your stay! Hotel Restaurant Juanito Platja is set on the seafront promenade, 10 minutes’ walk from Sant Carles de la Ràpita Marina. It offers free Wi-Fi, free parking and rooms with terraces overlooking Alfaques Bay. Rooms have air conditioning and heating. They feature tiled floors and a flat-screen satellite TV. The private bathroom comes with a shower and toiletries. A continental breakfast is available. The hotel restaurant has a covered dining room and, in summer months, guests can enjoy the large seafront terrace. Water sports are popular in the area and the Ebro Delta Nature Reserve is a 10-minute drive away. Reus Airport and Tarragona are an hour’s drive from the hotel. When would you like to stay at Hotel Restaurant Juanito Platja? Air-conditioned rooms with a terrace overlooking Alfaques Bay. They have free Wi-Fi, heating and a flat-screen satellite TV. The private bathroom comes with a shower and toiletries. This triple room offers 3 single beds or 1 single bed and 2 double beds. House Rules Hotel Restaurant Juanito Platja takes special requests – add in the next step! Hotel Restaurant Juanito Platja accepts these cards and reserves the right to temporarily hold an amount prior to arrival. Please note that the restaurants will be closed on Sunday evenings and Mondays from 15 March until 15 June and from 15 September until 17 November. The hotel bar will be open until 22h. Sea view. Restaurant. Staff. Very good! Location, proximity to the sea is amazing, and sleeping with the balcony door open and just listening to the waves lapping the shore ....amazing, as was the lunch and breakfast we enjoyed. We did not have any issues but some guests may note there is no lift in the hotel. A pool would be nice but is not necessary due to proximity to the beach/sea. Restaurant food was very nice, albeit a tad expensive. The hotel is old. Clean, but old. Not the easiest place to find but it is well signposted from the town centre.